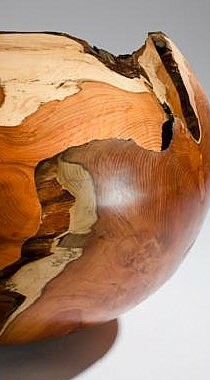 Creative woodturning and wood sculpture by Irish woodturner and wood sculptor Kieran Higgins. Each piece a unique original work created in native Irish hardwood, or ancient bog timber that has lain beneath the peat for thousands of years. "His finished products celebrate the quirkiness of the wood and its imperfections as he works with the splits and rough edges of this naturally black material. Lines are sometimes enhanced by the contemporary touch of slender silver staples, or sterling silver barbed wire that holds the piece together and provides additional texture on its surface."